In the LXX the order of these stories is as follows: Susanna precedes chapter 1; Azariah fits between our Daniel 3.23 and 24; and Bel and the Dragon closes the book in ch. 12. In the Latin Vulgate Jerome arranged the material as follows – Susanna become ch. 13 and Bel and the Dragon become ch.14. One hundred years ago it was commonplace among scholars to reject the Apocryphal writings on the presumption that they were written in Greek and not Hebrew or Aramaic. Today that assumption has been rejected outright. The Dead Sea Scrolls have caused most of the reevaluation. The three texts we are studying were all written in either Hebrew or Aramaic. Indeed some of the variant readings between the LXX and Theodotion can only be explained by Semitic Vorlage (if you would like more info on the languages check Carey A. Moore, The Anchor Bible: Daniel, Esther, and Jeremiah: The Additions, pp. 5f, 25-26, 81-84 & 119-120). The dates for the “Additions” is sometime in the second century B.C. Martin Luther called the Prayer of Azariah and the Song of Three Jews “a little spice garden or flower bed since much that is good, especially the hymn of praise, Benedicite is found among them” (Luther’s Works, vol 35, p. 353). Indeed, in the history of Christian worship both the Prayer and the Song have been used extensively through the centuries. 1) Prayer of Azariah (vv. 1-22); 2) narrative describing the intervention of God (vv. 23-28); 3) Psalm of praise by the three young men (vv. 29-68). An example of confession for the sin of the nation can be found in Nehemiah 1.4-11. Theologically three themes can said to be expressed through these Additions: 1) God works in human history; 2) God is also at work in individuals, 3) God is Lord of all, the Creator to be exalted and worshiped. The Song of the Three is a beautiful hymn of praise that resembles Psalm 148 and is structured like Psalm 136.
and do not annul your covenant. for the sake of Abraham your beloved . . .
as though it were with burnt offerings of rams and bulls . . .
such may our sacrifice bin your sight today . . .
for no shame will come to those who trust in you. . . .
and in your abundant mercy . . .
world. (vv. 11-12, 16-17, 19, 22). “This Hymn of Adoration, known as the Benedicite holds an honored place in all the liturgies of Christendom. Legendary as it is, it implicitly contains a splendid protest against idolatry, an invocation of all that is great and strong, beautiful and holy to join in the perpetual benediction of the Source of it all. Charles Kingsley regarded it as the very crown and flower of the Old Testament” (Value of the Apocrypha, p. 74). Bless the Lord, Hananiah, Azariah, and Mishael; sing praise to him and highly exalt him forever. For he has rescued us from Hades and saved us from the power of death, and delivered us from the midst of the burning fiery furnace; from the midst of the fire he has delivered us. We can justly join the great Church Father, Hippolytus (who had both Palestinian and Roman ties) who testified in his commentary on Daniel, “We may marvel at the words of the three youths in the furnace” (The Ante-Nicene Fathers, vol V. p. 191). Susanna, the hero for God, was extremely popular among early Christian artists. She is depicted in numerous catacombs and sarcophagi and even glassware. Piero Boitani even declared the closing of the second and opening of the third century AD to be the “age of Susanna” (See “Susanna in Excelsis” in The Judgement of Susanna: Authority and Witness, ed. Ellen Spolsky, p. 11). Boitani notes how these suffering believers (even dying) uses images of Susanna and asks the question of why. Susanna became associated with “death and resurrection” (p.10) for early Christians. Western artists have also delighted in portraying the dilemma of Susanna (Rembrandt; Guernico; Gewntileschi; Tintoretto; etc). Handel wrote an opera about her. Early Christians held her up as a model of piety and modesty and in various homilies (sermons). The legendary early preacher Chrysostom (A.D. 347-407) preached a great lesson on Susanna and elaborates on her chastity. A common reading of Susanna among the Fathers is that she is the Church of God hemmed in by her antagonists the pagans and the Jews. Some scholars believe there is an echo of Susanna in the NT through the story of the woman “caught in the act” of adultery in John 7.53-8.11. There are some interesting parallels indeed and it is possible that John used Susanna as a “model” of how to tell his story. Regardless of how we can or cannot trace the influence of Susanna in the pages of the NT or in the doctrinal debates of the early church there can be no doubt whatsoever that for the common Christian in those early centuries held Susanna at a “gut level” near their heart. As the martyred Hippolytus urged in his commentary (already cited above) “let us imitate Susannah.” It is a shame that a story that exercised such comfort and encouragement to disciples in the ravages of persecution in the early church is basically completely unknown by most American Evangelicals today. I have previously blogged about “blessed Susanna” in my Women on the Family Tree series. You can access that blog HERE. Bel and the Dragon are at times called the world’s “first detective story.” Dorothy Sayers included both Susanna and Bel and the Dragon in her anthology of “mystery stories” in her classic work Omnibus of Crime (1929). The purpose of these two episodes in Daniel are to pour ridicule on idolatry and to discredit pagan priest craft. Bel, whose proper name was Marduk, was the most popular god among the Babylonians being their patron deity. One of the “Seven Wonders of the Ancient World” was the colossal temple to Bel in Babylon. “Daniel said, ‘You have remembered me, O God, and have not forsaken those who love you” (v. 38). 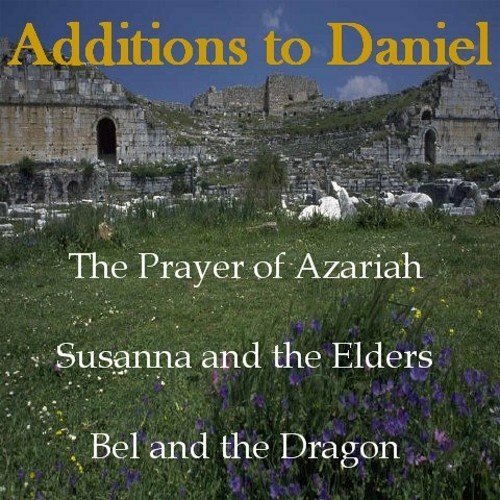 As we continue to reflect on the Ancestry of the King James Version throughout 2011 it will be recalled that in the “real” KJV these additions to Daniel were included in the section labeled Apocrypha following Sirach. This entry was posted on Thursday, June 16th, 2011 at 5:19 pm	and is filed under Apocrypha, Bible, Church, Church History, Daniel, Exegesis, King James Version, Martin Luther, Septuagint, Worship. You can follow any responses to this entry through the RSS 2.0 feed. You can leave a response, or trackback from your own site. Thanks for making it know to us. What an insteresting pen u have .